The Castles and Town Walls of King Edward in Gwynedd are four groups of late 13th-century and early 14th-century militairy fortifications. 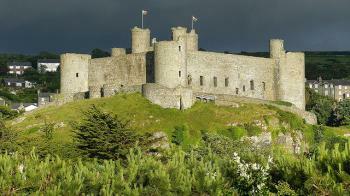 They were built or rebuilt by the English King Edward I when in 1283 he expanded his domain into north-west Wales. He set out on an ambitious project, to build an “Iron Ring” of castles and new towns to house English settlers. All were built by the same man, James de Saint George from the Savoy, the king's chief architect in Wales. Harlech Castle (1283) – a concentric castle, constructed atop a cliff close to the Irish Sea. 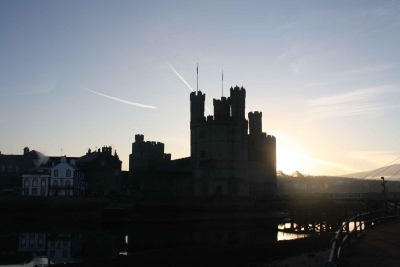 Coastal town of Caernarfon (from 1283) – has a deliberate link with Caernarfon's Roman past, and with its banded coloured stone the castle's walls are reminiscent of the Walls of Constantinople. Castle and town walls of Conwy (1283-1289) - no concentric 'walls within walls' here because of its strategic position on a rock; it still has a full circuit of town walls. Probably the most exciting thing is getting there, especially to Beaumaris Castle which is located on the island of Anglesey at the northwestern tip of Wales. The motorway follows the coast, and takes you through a series of tunnels. After each tunnel the clouds became darker, the wind stronger and the rain more persistent. It feels if you're approaching the end of the world. I finally arrived at Beaumaris via the modern bridge and some narrow, winding roads. It is a small town, with the castle prominently located in the center. My visit was a bit hurried because of the rain pouring down, and because I had not paid for the parking as I had no coins left. Actually all parking spots I have had over this weekend had to be paid in small change, strangely there was no other way to pay. Beaumaris Castle has all the usual features of a medieval castle. What is left is the complete outer ring, surrounded by water. Inside there's not a lot to see - about as much as you can expect during a half an hour visit and for a 3.80 pound entry fee. I then drove on eastwards again, to Conwy, via the Menai-bridge (another Industrial Revolution-design by Thomas Telford). Conwy has a very different set of fortifications from Beaumaris. They are located higher up on a rock, and the castle is adorned with lean turrets. It's an impressive piece of work from a distance, more palace-like in features than Beaumaris. It also has two elaborate suspension bridges from later date that complete the view. 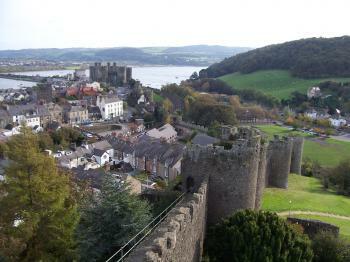 Conwy not only comprises a castle, also the old town is enclosed within walls built by James I. A visit here is a popular outing on a Sunday afternoon: there were hundreds, probably thousands of tourists around. Conwy is close enough to Liverpool for example for an easy day trip. I started with lunch, and tried the local mussels which very tasty indeed. Then I went into the castle. Like the one in Beaumaris it is mainly the walls that are still standing. The design of the towers makes it more picturesque. I climbed some of them to enjoy the views. In all I wasn't completely taken over by these castles. They're said to be a kind of prototypes of all medieval castles in Europe (or at least among the oldest surviving ones from that period), so it's more their age we should appreciate than their visual uniqueness. A bulwark of a city and the castle could be from a fairy tale, home of a brave knight. The next morning we could see the whole beauty of this town with snow covered hill in the back. We had breakfast in Bangor which I do not recommend visiting, the close by Penrhyn castle however is amazing and definitely worth a visit. We were hoping to see Beaumarais from there, but except the outlines there was nothing to see. After that, we still visited Conwy Castles. Way more tourists here, but we bought a nice wool blanket here, made a few miles south in Tweedmill. After a series of two industrial WHS, it was nice to see a more traditional WHS in the form of the Gwynedd Castles. These are 13th century castles built over a relatively short time period. Their purpose was to pacify the area after the recent English conquest by King Edward I. Of the castles I managed to see two: Beaumaris and Conwy. Conwy as pointed out by previous reviewers is a walled city with a castle towering the town. Beaumaris meanwhile is the last one in the series of castles. It was never finished. Personally, I preferred the seaside charm and the larger scale of Beaumaris castle over Conwy town and castle. The tourist masses tended to go the other way. To me this was another advantage of Beaumaris. On a more general note, I find it interesting, that WHS sites often tend to be sites on the periphery that fell out of fashion and were stuck in one time period. In the case of the Gwynedd castles Edward I attention wandered North as he had to deal with the Scots. He also ran out of money. While there were rebellions for the next centuries Wales has been British ever since. I found the information on google maps for the area correct and very helpful. Please cross check before you go. There is a direct train line from Birmingham to Holyhead with stops in Conwy and Bangor. You will actually pass right below Conwy Castle. Via Chester you can also connect by train to Manchester and Liverpool, so you have ample options to travel on. As stated in my previous reviews, Pontcysllete Aqueduct and Ironbridge Gorge are well within reach and can be combined into a nice weekend trip. Bangor probably is the best base to explore the area. Due to high season and many weekend guests, I had to stay in Menai Bridge as Bangor was fully booked. Both Conwy and Caernafon have regularly served train stations. To get to Caernafon you have to change in Bangor. In Conwy it may make sense to cross over to nearby Llandudno Junction as it’s served by both Arriva and Virgin trains and connections are more frequent. For travelling between Bangor and Conwy I would recommend the bus as you get nice views of the coastline and the slopes of Snowdonia. It may also be cheaper. Beaumaris is served by bus from Bangor (bihourly on Sundays, not sure about the rest of the week). The trip to Beaumaris is fairly straightforward. The return journey, meanwhile, was marked by multiple loops all across Anglesay Island and another one in Bangor, so it took twice the time (45min). Three of the four castles lie on the slopes of Snowdonia and the little I saw looked amazing. Sadly, my tight schedule wouldn’t allow me to venture into the mountains. Anglesay Island itself was also pleasant and scenic, especially at low tide. There are also boat rides to Puffin Island from Beaumaris and Conwy. If you are into those cute little suckers, but who wouldn’t be?. I am generally a late hotel booker (previous night, same day). While my strategy generally works (and sometimes fails miserably), a weekend trip in high season to Bangor is not the proper area to apply it. This is a popular British weekend getaway, very deservedly so, so book in advance. I visited this WHS in June 2016. I drove to this beautiful part of North Wales and I visited all four sites. I stayed for one night in Harlech and shared the moments of joy with Welsh fans as Wales advanced to the quarter final of Euro 2016. The scenic countryside alone (arriving from Pontcysyllte) was worth the visit. After a very wet day, the dark black sky opened up just a bit to let the reddish sunset rays on Harlech castle (picture). Harlech castle was my favourite from the series as it had less visitors, felt more authentic, and the Morfa Harlech National Nature Reserve (and golf course) just opposite was worth visiting. I'm no golf fan but I would have loved to play in such a serene environment. Thanks to Wales' historic performance at the Euro 2016, free entrance was granted to everyone visiting the Gwynedd castles so I was extremely lucky not to pay for any entrance ticket. Next, I visited Caernarfon which is set very close to the sea and has city wall remains which are worth visiting (you cannot walk on the walls here like in Conwy). The personnel employed in the Caernarfon castle were overjoyed to welcome a WH traveller from Malta and the 'manager' was very attentive to anything related to the UNESCO WH list. We had a lovely chat and he pointed out that he had personally asked for the UNESCO plaques to be removed as the Gwynedd castles inscription took place in 1986 not 1987. Next, I visited Beaumaris after crossing the Menai bridge. There are many seabirds here and a short cruise to the nearby Puffin Island and Menai Strait (departures just opposite the castle) will fit in perfectly if you're into birdwatching. All the castles have pretty much nothing left inside and their interior is mostly visited by visitors with children. 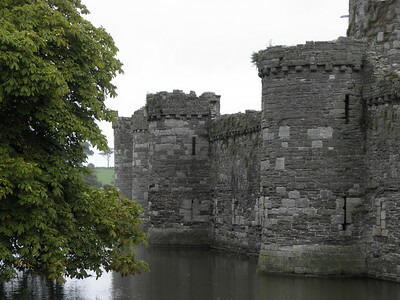 Beaumaris castle is perhaps the best example of the series (both interior and exterior) and the moat surrounding the castle enhances its symmetry. I enjoyed the short video shown inside the castle and it helped me appreciate certain aspects which I wouldn't have noticed otherwise. Last but not least, I visited Conwy which is the most touristy and visited castle of the series, being very close to Liverpool. The walk on the surrounding walls offers beautiful views of the castle and it would have been enough the appreciate the castle (since it was free though I had to take a quick look inside at least). I enjoyed my second visit in Wales and I'm very happy I've seen all the Welsh WHS. I visited Conwy & Caenarfon in March 2015 and Harlech & Beaumaris in May 2016. Entry to the castles is now £6 each. Caernarfon felt less spoilt. We drank at a historic pub, the Black Boy Inn, which, being within the city walls of a World Heritage Site, was just my cup of tea. The following morning my brother and I toured the castle in the rain. Harlech was probably my favourite of the four, and has a newly refurbished café and visitor centre to boot. From the turrets you get a great view of the sea and coastline – the latter of which is now significantly further from the castle’s walls than it was in Edward’s time. 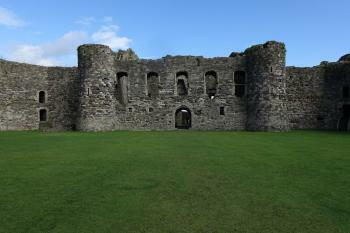 Beaumaris castle is located at the other end of the Menai Strait to Harlech, sitting at its northern mouth. Beaumaris is a schoolboy’s idea of what a castle should look like. Surrounded by a moat, it follows a classic concentric design – consisting of an outer wall and an inner wall. UNESCO calls it one of “the finest examples of late 13th century and early 14th century military architecture in Europe”. These days it seems to belong to the seagulls, dozens of which were nesting up in the ramparts when we walked around. After the castle we returned to the mainland via the Menai Suspension Bridge. I had assumed it was newer than the 1864 Clifton Suspension Bridge near where I live, but it was in fact completed in 1828, making it the oldest major suspension bridge in the world, if I’m not mistaken. These have to rank as some of the best places I have visited in Britain. 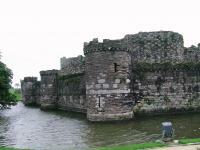 At the start of November 2006 we visited the Castle at Beaumaris and spent a night in Conwy, and it was fantastic. The castle at Beaumaris is situated on the Island of Anglesey at the end of this quaint town that overlooks the treacherous Menai Straits. This castle was the most technically progressive of King Edward's 'Ring of Iron'. It is quite easy to see how the main defences work; they provide a barrier to invaders, if that is breached you are then in a kind of void where it would be easy for the defenders to pick you off. All in all there are about four separate lines of defence, with masses of other small details that would help to protect the castle from invasion. There is plenty for you to explore inside the castle, and the view from the wall walk is great as you look out across the Straits to the Snowdonia Mountains. If you have an interest in Bridges this is also a great place to visit, the two Bridges across the Menai are some of the finest pieces of engineering from the Industrial Revolution. We then carried on to Conwy, which is completely surrounded by impressive Town Walls, and the walk along the top of them was perhaps the highlight of the trip for me (picture). The town itself is lovely, and the castle in the corner of the walls is very impressive, with small versions of the two Menai Bridges leading away from it. It was a great place to spend a night in a traditional Welsh B&B. The backdrop to the Town as with all of these castles is the magnificent Snowdonia National Park and if you wanted to spend longer here then it is really good for hiking. A year after my first visit, we went back to spend another night in Conwy, and also visit Caernafon. Conwy was as nice as we remembered it, and Caernafon was very interesting to walk around. The castle is perhaps the most historically significant, and has a strong role in Welsh history and identity. It was also great to walk around the town and here that Welsh was the first language of most people there. The city of Bangor is the best connected in the area for transport to the castles. All the timetables are integrated at the traveline site. The area would be good to explore from the WHS of Liverpool or on the way to/from the ferry for Dublin. This was one of the best WHS I have seen in Britain and I would have no problem in going back to Harlec castle and spend another quiet night within the city walls of Conwy, great if you want to see a different side of Britain. Harlech castle was spectacular for its location and great views.